Get Your Next DOT Physical Exam from our convenient, driver helpful office located in Ventura, CA! Pass Your DOT Physical Exam! Dr. Barnes knows how important it is that you continue your livelihood as a commercial driver. With his extensive knowledge of the DOT Physical Exam medical guidelines, Dr. Barnes will steer you through the DOT Physical Exam requirements so you can Keep on Truckin’. Put Dr. Barnes’ knowledge and experience to work for you! Need your DOT Physical Exam Today? We know your time is valuable! Same Day Appointments are routine, just give us a call! No Waiting! We are committed to getting you back on the road in no time. Get the friendliest, fastest and no hassle exam of your career! Little to no wait time and walk ins are always welcome. We are conveniently located in Ventura, CA just off the 101 Fwy, at the California Exit. Free! Never Forget to Renew your Certificate! Get “Expiration Alerts” before your Certificate Expires by downloading the Free TeamCME Driver App for IPhone and Android mobile devices! Save your expiration date and you’ll get “Expiration Alert” emails sent to your mobile device & alert emails starting 2 months before your current certificate expires. Looking for a DOT Physical Exam or CDL Physical Exam in Ventura, CA? You’ve come to the right place! Remember: Get the friendliest, fastest and no hassle exam of your career at our office in Ventura, CA, conveniently located off the 101 Fwy, at the California Exit! 101 Fwy. North exit California. Our office is located 3 blocks east of California on Main St.
Dr. Pierre Barnes is a National Registry of Certified Medical Examiner and has been in practice since 2001. He has performed thousands of D.O.T. Physical Exams and C.D.L. Physicals for commercial drivers. 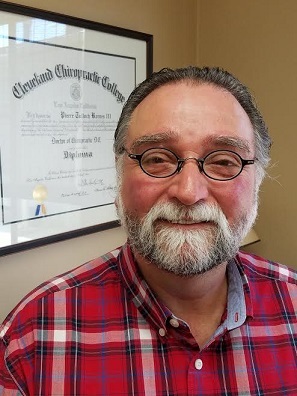 Dr. Barnes graduated from Cleveland Chiropractic College - Los Angeles in 2001 receiving the Doctor of Chiropractic Degree. Dr. Barnes has served as a medic in the USAF and was stationed at Wilford Hall Medical Center, Lackland AFB, San Antonio, TX. He also owned and operated a German Car Repair Shop for many years prior to becoming a DC. He knows quite well how to relate to a commercial driver with his previous background.